Oftentimes, our first instincts are correct. An effective strategy is to guess, flag, and move on. 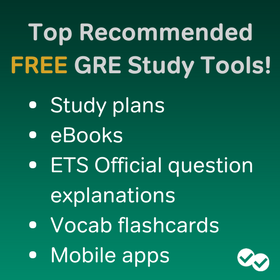 Because the Revised GRE always allows you to scroll through the section, take advantage of this and do not waste too much time on one question. By flagging a question, you can always return to it later. If you run out of time, don’t worry—since you have at least answered the question (going with your gut instinct), you won’t lose the opportunity to answer the question later. On the other hand, if you leave the question blank, then you miss the chance of receiving a point for that question. Remember, there is no penalty for guessing. So, always go with your gut and guess. On the new GRE, every question is weighted the same. That’s right, the math question with a sphere embedded in a cube embedded in a cylinder is worth the same amount as the question that asks you for x, in 2x = 10. So, don’t waste your time on difficult problems, but find the easier ones. In essence, you can think of the GRE section as a tree filled with identical apples, each apple corresponding to one point. You will want to grab those apples that are easiest to get to, instead of spending all your time climbing to the very top of the tree to pick an apple that is an arm’s length away. Another important point to remember is that the new GRE randomly peppers the section with the difficult problems. So, the sphere problem above could be the first question, the last question, or anywhere in between. If you come to a cluster of difficult problems, skip over them and look for the easy questions. Go for the low hanging fruit. This third point is related to the first two points. If you only go for the low-hanging fruit, i.e. 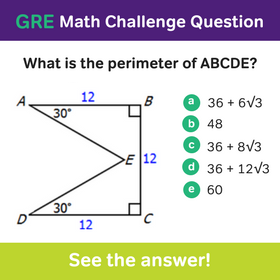 the easy problems, and flag every other question, then you are most likely hurting your score. So, do not start skipping every problem just because you feel it is somewhat difficult (this is the GRE, after all). Be judicious, and make sure that you skip only the hardest problems or passages. If you loathe long science-based reading passages, then you may want to leave such a passage to the end. On the other hand, just because a passage is really long and forbidding does not mean you should automatically skip it. If you are stronger at science, then this is your moment to shine, even if the passage is more difficult. An easier passage on Virginia Woolf’s use of implicit characterization in her heroines may actually be much easier. But, if the topic matter has you eyeing the nearest exit with a feverish intensity, well, then maybe you should come back to it later. This last piece of advice clearly falls under that hackneyed phrase: easier said then done. A good way to become less frazzled by the timer is to practice using the Powerprep software or Magoosh, in which you will always a timer ticking away each time you do a question. Not prepping in this fashion can hurt you on test day, when the clock suddenly begins to singe itself into your retinas, making it difficult to focus on the material at hand. So I know you said that every question is worth the same amount of points. However, if that is true, how does it make sense that how high a score you can get is dependent on if you do well on a section to then get a harder section the next time…. I thought your score was dependent on this… If the section gets harder yet every question is worth the same amount wouldn’t you not want harder questions? I’m confused. I would be happy to give you some information about GRE scoring. If you want to read the full documentation from ETS, you can read it here. In short, The GRE is adaptive between sections, but not within. What this means is that the questions do not change within the section depending on whether you answer them correctly. You can think of it this way – each section is static. Your performance on the first section will determine whether you get an easy section or a difficult section. Is there any penalty for unattended question?? Because i’m not able to complete the whole set of questions on verbal in 30 minutes. As far as they are concerned, you should not guess unless you can eliminate at least one answer choice as improbable. why do you say there is no penalty for guessing when ets.org says there is? Thanks Chris.. this is really helpful. For the Quant sections i am stumbling a lot in graphs. Can you share any tips on that. With graphs practice is key. Do some practice questions and review your mistakes. Understand why you misinterpreted the graph. Approximation also helps a lot on graphs, at least from a timing standpoint. Also, with many graphs, you need to spend a little time to decode the information, especially if the graph is not your typical pie/bar set up. I scored 151 in Quant and 148 in Verbal; 650 and 420 according to the old scoring patter in quant and verbal respectively. In the Powerprep i had got a range of Verbal: 470 – 570 , Quant 730- 800. Apart from other topics I saw a couple of questions on Stats, Inequalities, probability and co ordinate geometry. I remember these in particular as they are my week areas 🙁 i was comfortable with Graphs. I still think i could have done way better in Quantative. Regarding Verbal, i am struggling a lot with time management. RCs bounce over my head due to time pressure and CR is not my strength. The saving grace was vocabulary, i had done the Kaplan word lists and flashcards and i felt they were good enough. In practice tests i felt that doing sentence equivalnce/completion first and then RC might help but i don’t know if it did. I was left with 2 big RCs in the end i.e 5-6 questions. The time pressure adversely affected my calm and understanding.Time was an issue even during the mock exam when i wasn’t keeping the RCs for the end. I am disappointed and need to take the GRE again. It’s quite upsetting. I have to now figure out an effective study plan. I am not interested in taking any group classes as i feel that i don’t need to start from scratch. Pls advice , and it will be great if you could help me in coming up with an effective study plan to improve in the verbal section. The CR passages are indeed tough. I’d recommend going through any of the RC-related posts on the blog (if you haven’t so already) are even sign up from Magoosh, if you haven’t done so already (everything is self-paced so you learn at your own pace). 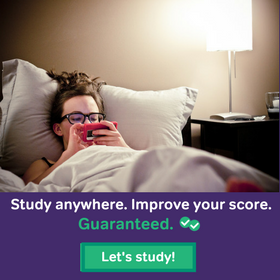 Also you might want to check out the different study plans. You could tailor them to your time schedule and focus on the RC component. Thanks Chris. Need some more advice. I have to retake the GRE and it’s scheduled for 28th July. I am now considering to take up one of Magoosh’s Test prep plans because of the feedback i have read and the (always) helpful attitude shown by you and your team. Is there any specific plan that you would recommend for me. To help you answer my question better here’s my brief history of standardized tests. I took the GMAT first and it bombed. it’s been 10 years since i left school and had been totally out of touch with math so GMAT wasn’t my kind of thing. I then decided to take the GRE (the much preferred test for the courses i want to apply for) My relentless GMAT math practice helped here. I even did a lot of vocab. I got 148 in Verbal and 151 in math. My challenge in Verbal is Time management, RC and Critical reasoning questions.I am even looking for some strategies to deal with the verbal section better. Regarding Quant section, i’d like to sustain or increase my level. A higher score will push up my chances of addmission. In Quant my weak areas are : Stats, Permutation & Combination ,Co-ordinate Geo,Inequalities. Regarding how much time i have ? Well, i have the whole of July to myself. June is a very busy time and i might not be able to dedicate more than 1 hr a day. So I think Magoosh can definitely help out given our plethora of questions. For both Q and V, the computer setup will help you hone your time management skills. Specifically, I’d recommend you start off by going through the lesson videos in both the verbal and the quant. The verbal lessons are filled with helpful strategies and pointers. For the reading comp. you can also create mock tests and go through questions of varying difficulty levels. We have plenty of questions–difficult ones too–that cover Combinations/Coor. Geo./etc. And if you don’t understand a concept you can always go through the many math lesson vidoes, which make even combinations seem far less daunting. Hopefully, that answered your question :). But if not, let me know if there is anything else you want me to address. I have about ten days before my GRE, and I’d love some advice on how I should make the best use of this time. I’m an Artsy and I’ve always had a mental block about Maths. I find I’m not so much relearning things from high school as learning (or at least understanding) them for the first time (makes me wonder how I passed back then!). I went through the Maths section in Barrons, and then took the Paper-based ETS test and got a projected score of 710-800 (so at the lowest, 72 percentile) in Math. That was a month ago. Yesterday, I took the Power Prep mock exam, and I got 750-800 (so at the lowest, 82 percentile) in Math. I got no wrong answers in the first section, and 5 wrong in the second section (ran out of time for two). I do feel like some of my answers were flukes, because I just *happened* to see the logic in solving them without panicking. I find my main problems with Maths now are that a) I sometimes mix up rules, esp for exponents and algebra, and b) I *understand* the concepts, but if I don’t have a ‘eureka’ moment while reading the question, I get it wrong (only to see the answer and say ‘oh, right’). Not sure how best to tackle this! Is it just me, or are the ETS questions much easier than both Magoosh and Barrons? I have to say it’s nice being able to solve some ‘hard’ Magoosh questions because I then feel like I can probably take on a bit more. Great improvement! The 750-800 range is a great place to be. As for some last minute advice – I would say that Eureka movements tends to sneak up on you when you leave a question alone for awhile and then come back to it later. The key, as you mentioned, is not to panic. The next thing I would recommend is to continue working on difficult level problems– that is, assuming you are strong at every concept on a fundamental level. If there is any one area of weakness, direct your time and focus there. For instance, if you struggle with exponents at a basic level, do practice problems vs. doing challenge problems in an area in which you feel more comfortable. I realized i should have provided some background info. I’ve taken the GMAT 2 years ago and score a 690, 38V 47Q. Those are all great questions. And sorry to hear about the testing center mishap – part of the expat experience, as you said. Making the most out of those extra thirteen days is ideal, however, with time obligations, life in general that is not always easy to do. The main thing is that you don’t lose your current level. To maintain your edge I would continue doing timed passages, specifically those questions that you find difficult. I know at this time there is probably a lot of redundancy, i.e. you’ve seen the content before. Nonetheless practice these problems because it is more about time than whether you recognize the problems. Work through powerprep on-line and the Official Guide again. Use the difficult GMAT and LSAT passages for verbal and, if you have the old GRE guide, some of the sentence completions from there. That is create your own difficult mock tests to keep you in-shape for test day. And as you’ve taken the GMAT before, you won’t be completely new to the 3-hour plus grueling test experience. Hi there. I just got informed today that my GRE test got rescheduled from 2 days later to 13 days later due to technical problems at the testing centre. I’m taking it in Dhaka, Bangladesh because I happen to be doing an internship there now. I guess this is part of the cultural experience..glitches do happen. I have been following the 2 month study guide..but cramming it into a one month period. i.e. working off LSAT’s long passages / logical reasoning, + reading New Yorker + Atlantic + Economist articles + being a word detective + Official GRE Guide + OG Gmat + Barrons + Magoosh of course. Given this turn of events, how do you think I should best proceed? As for Math, i dont have much problems with it. As u rightly point out, its about being less careless. None of the concepts are mindblowing. Just now I took the ETS Powerprep mock GRE test without any kinda preparation whatosever, it gave me a score range that said 1230-1370. How much do you think I need to improve to reach a 1400 above score. and also the time it’ll require me to slog. Have no idea where & what to start with, besides deciding to buy a Barron’s Gre! That’s a great score, given you didn’t need any preparation! To score at the 1400 level, you may have to do a little bit more work but I don’t think you’ll necessarily have to “slog” that much. Barron’s is a good place to start. Skip PR – too easy, content is mediocre. 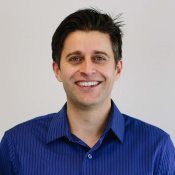 And skip Kaplan – content is uneven. Below is our 30-day study plan that may work out for you. Again, since you are starting at a higher level you could modify it to meet your requirements. Let me know if you have any other questions, and good luck with your prepping! I think MST format will account for difficulty levels of our tests. I am anticipating the second math and verbal sections being difficult than the first, and hence challenging time-wise and content related. The trick here will be to kill right all problems within the required time limits. I am sure couple of mistake in the first sections will account for less than the same amount of mistakes in the second section. As far as we get 16 out of 20 correct, the test should spiral in its difficulty level to the 90 percentile questions. And there we should be very diligent not to make silly mistakes or panic in the last two-three minutes left on with three-four questions. I’m not quite sure what you mean by MST. As for the way the test determines which section you get, i.e. how many can you miss an still receive a more difficult section, I’m unsure on. But you’re right in terms of overall strategy – try to answer the easy one’s first. As long as you don’t get “scroll happy” and skip every question, this strategy should be helpful. Hang on – every question is weighted the same? I actually would like it better if difficult questions were accorded a greater weight – after all, answering the question that requires the quadratic equation shows mathematical chops far more than if you have a mental math burp on an easy question. But as I don’t think ETS plans to change the algorithm any time soon, the strategy – both in my post and in the quote above – still holds true. Thanks Chris! Super helpful as always – I pore over these things so carefully that I’m surprised I missed that detail. Equally weighted questions could actually be a good thing for artsies – it could be a fighting chance even if I never fully grasp some of the more abstruse material (or integer properties!). I’m thinking of purchasing Magoosh’s math prep (hope I have time to really utilize it given that my test is 3 weeks away). Thought I’d check with you: in case I end up having some basic questions to fully clarify/grasp a concept after watching the video lessons, will I be able to direct them to anyone? I’m happy I could be helpful. And don’t worry – whenever you have a basic question just click on our feedback tab. Someone will get back to you within 24 hours (they usually get back to you much faster than that!). And whenever you have a general question let me know. I’d love to try to answer it! Does this mean that even if we get an easier second verbal and math section, the questions will be weighted the same? Does doing bad on the first verbal and math sections affect our scores at all?